Poo’s organization works to build respect, power, and fair labor standards for 2.5 million nannies, housekeepers, and elderly caregivers in the United States. The National Domestic Workers Alliance successfully helped lobby for the passage of the California Bill of Rights, which extends overtime protections to personal attendants who care for individuals and families in California. We are experiencing a moment of “paradigm shift,” Poo said. Four million Americans turn 65 each year as Baby Boomers age. By 2050, 27 million Americans will need some form of care or support to meet daily needs. These aging Americans will need enormous care and will be attended to by these very domestic workers who face deplorable conditions and little compensation. It is in our own best interest, she said, to ensure that those who care for our loved ones are also cared for themselves. “We need an exponentially stronger, larger workforce, and quite frankly, a whole new approach to caregiving to meet the profound need, and changes that are happening,” she said. Earlier in her speech, Poo told the story of a Filipina caretaker who assists the elderly in Chicago. She has cared for over 20 seniors, helping them live independently by performing tasks like cooking, cleaning, administering medicine, and providing physical therapy. She works 24 hour shifts, four days a week, “ensuring the dignity of the elderly” with whom she works, Poo said. For all this she takes home between $5 and $9 per hour. Not to mention that she is supporting five children at home in the Philippines, and as a result often goes for days surviving solely on bananas and hard-boiled eggs. "It is a future that we all deserve," she said. 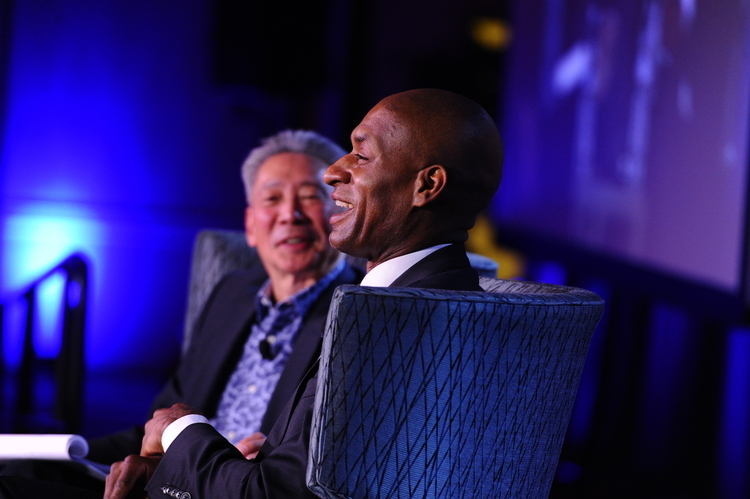 This is it, journalist and commentator Charles Blow told the audience. This is us having a national conversation on race. Michael Omi, UC Berkeley professor and associate director of the Haas Institute, had just asked Blow what a serious national conversation on race would look like, and the journalist was definitive in his response. Blow, who serves as an op-ed columnist for The New York Times and regularly comments on issues of race in America, said that all too often these conversations are just “preaching to the choir,” or the “aggrieved” talking to the “aggrievers.” We are all “raced,” he said, but it is inarguable that some people’s race benefits them more than others. When they got home, his friend’s father, who was also black, told them not to do anything. But, he said, the fact that people are now saying “enough is enough” is a step forward from those days. That step forward, Blow said, has come in the form of not just protests but also technological advances like camera phones and social media. “Thank god for videophones,” he said, to loud applause. Earlier in the hour, Prof. Omi began the discussion with a question about Blow’s experience with fraternities while in college. A good portion of Blow’s book, “Fire Shut Up in My Bones” deals with his experience with hazing when joining an African American fraternity. “There is no way to hold yourself harmless when you are in the commission of cruelty. By the time you're finished with that much scarring, you're no longer even yourself,” he added. The discussion later veered towards religious freedom and Indiana’s controversial “religious freedom” bill, which many critics saw as legal permission for businesses to refuse service to members of the LGBTQ community. A week after it passed, lawmakers were pressured to soften parts of the law after a number of companies and public figures announced they would effectively reduce or halt actions in the state. Blow was unimpressed by the reversal. The conversation closed on a lighter note, when Prof. Omi posed a query that Haas Institute Executive Director john a. powell asked the staff at a recent meeting: Al Green or Smokey Robinson and why? Sometimes we are othered by people who are seen to be outside of the community that we are a part of. But a lot of times, we other ourselves, often as a defensive mechanism fueled by self-preservation. We want to protect ourselves and take care of ourselves, and in times and situations of high stress or high stakes, it is almost instinctual to remove ourselves emotionally, socially, and physically by “othering” ourselves. Since we cannot eliminate implicit bias, we cannot discount our experiences in this world, and we cannot move forward without love, how do we learn to love people who appear to be different from us? How do we embrace belonging, the ideal of perfection, when we are in fact imperfect people? john always says that no human being is outside of the circle of human concern. So what does that mean for us? What is the work that we have to do in order to get to the place of belonging? Joanna Macy, joined on stage by Rudy Mendoza-Denton and john a. powell, centered her speech not on the othering of other individuals, or even the othering of other groups, but on the ways in which we other ourselves. We have to be able to see the results of our behavior, she said. "That is crucial feedback that can guide us. We take refuge in our own powerlessness,” she added. It is only then that you begin to see how big you are, and how far you can stretch beyond the social constructs of your isolated self, Macy said. We all want to belong, she said at the end of her speech, and we experience belonging by “doing together.” By linking arms and getting out there and doing things you admire each other for, taking risks for the things you believe in.